There can be few computer users who do not have at least one social networking account – the likes of Facebook and Twitter are just so prevalent these days. But while it’s easy to sign up for an account, closing one down is not always so simple. Until now. We recently looked at how you can go about backing up the posts you have made and the photos you have uploaded to various social networks. Before you take the step of closing down your account, you might want to consider doing just this so you at least have a record of your online activity. Since it is possibly the most popular social network, it makes sense to start by taking a look at Facebook. Here there are two options available to you if you decide that you are in need of a Facebook sabbatical. 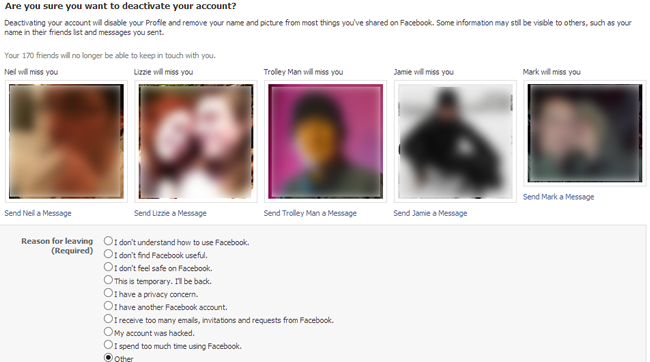 If you’re not sure about how serious you are about leaving Zuckerberg’s network, deactivation may be the best option. Going down this route basically puts your accounts on hold and enables you to reactivate should you change your mind further down the line. To start the process, pay a visit to the deactivation page. You will be reminded that your Facebook friends will not be able to contact you (through Facebook, at least), but you’ll need to specify why you are choosing to leave. This done, click Confirm and you will vanish from Facebook until you decide to reactivate – this can be done by simply logging into your account as normal. If you decide you want to take things further and completely delete your account, you should visit the account removal page instead. Click the Delete My Account button and you’ll be asked to provide your password and complete a captcha. You are still given a slight safety buffer. 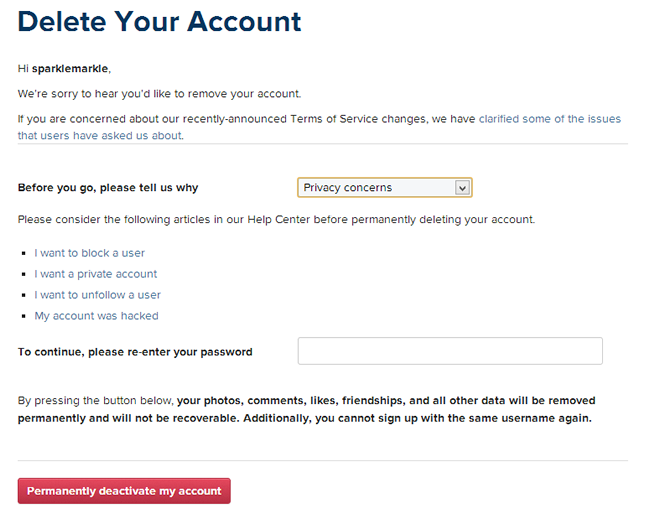 Your account will initially be deactivated and will be completely deleted provided you leave it alone for two weeks. Resist logging in for 14 days and your account will be gone forever. Had enough of tweeting? Head over to the Twitter website, log into your account, click the cog icon to the upper right of the page and select Settings. At the bottom of the page, click the ‘Deactivate my account’ link. 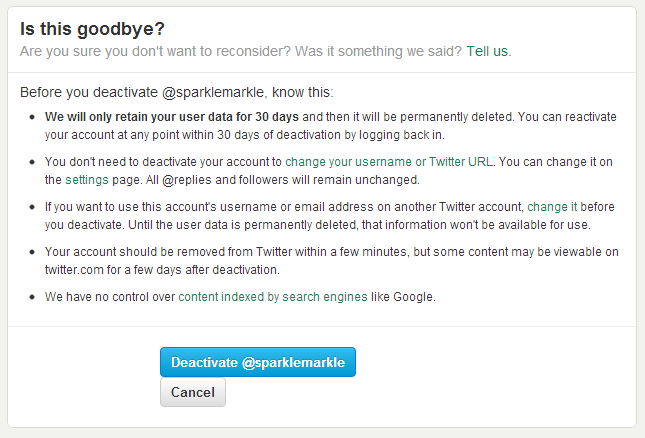 Click the button to deactivate your account. As the warning points out, your account will initially be deactivated and after 30 days of inactivity will be deleted. If you change your mind about leaving Twitter, simply log back into your account within 30 days of deactivation. You can opt of out of using the Google+ component of Google, or you can cut ties completely. Head over to the Google website, click your account avatar to the upper right of the pages and then click the Account link. There are now three options available to you, although looking in the Account Management section of the page you’ll only see two listed. 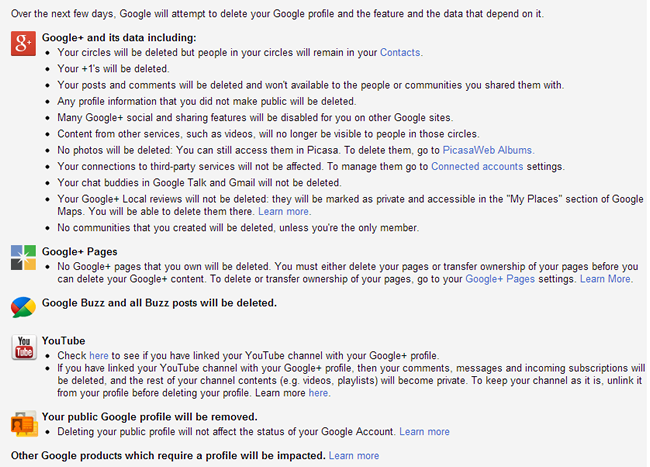 If you just want to abandon Google+, click the ‘Delete profile and remove related Google+ features’ link. You can then choose between deleting just your Google + content, bearing mind all of the caveats that are pointed out – such as losing the ability to use Sign In With Google on various websites. Tick the Required box and then the ‘Remove selected services’ button. Alternatively, you can select the ‘Delete your entire Google profile’ option. This will enable you to wipe out your presence from not only Google+, but also YouTube and Google Buzz. 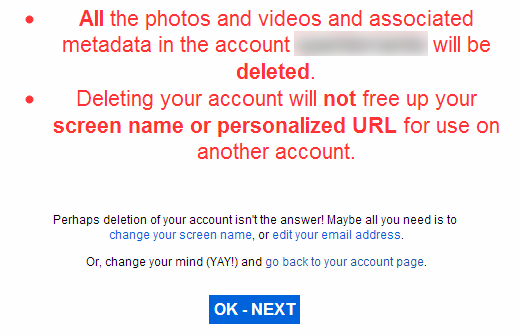 Google also enables you to completely delete your account – just click the ‘Close account and delete all services and information associated with it’ link in the Account Management section of your account. As this process involves deleting a large amount of data, you will be asked to confirm that you definitely want to proceed. Check each of the boxes next to the various Google service – from AdSense to YouTube – and then enter your password. You’ll also have to check the ‘Yes, I want to delete my account’ option before you click the Delete Google Account button. If you feel you’ve shared too many photos through Instagram, you may decide that the easiest option is to simply close down your account. Pay a visit to the Instagram website , click your username to the upper right of the page and select Edit Profile. Towards the bottom right of page, click the ‘I’d like to delete my account link’, use the drop down menu to provide a reason for the deletion, and then enter your password before you click the ‘Permanently delete my account’ button. Instagram is far from being the only photo sharing service, and Flickr is probably still the most popular in some circles. To delete your account and online photos, log into your account, click the smiley icon to the upper right and select Settings from the menu. Near the bottom of the page, click the ‘Delete your Flickr account’ link and confirm that you’re happy to continue by clicking OK – Next. These are just some of the online services you may want to walk away from – there are many, many more that you may have used and changed your mind about. We could list every single online account you might want to close here, but that would make for a very long article. 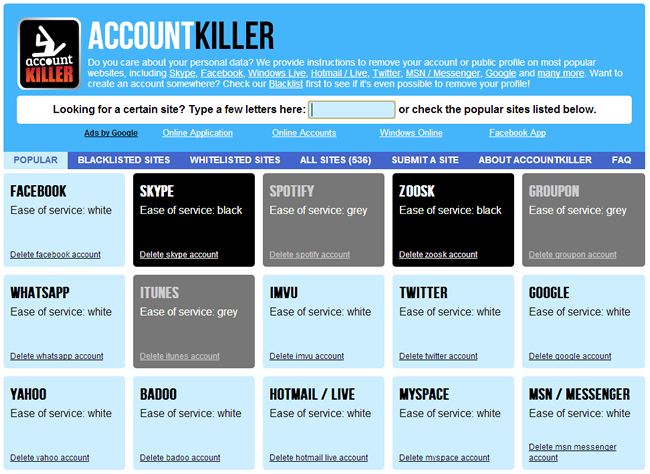 You might also want to take a look at AccountKiller which provides details of how to delete all manner of online accounts. Services are organized into a whitelist (those that provide a simple account deletion process), a greylist (those that are a little troublesome) and a blacklist (those services that do not allow for account deletion or make it tricky). Have you had trouble deleting a particular online account? Share your experiences in the comments below.